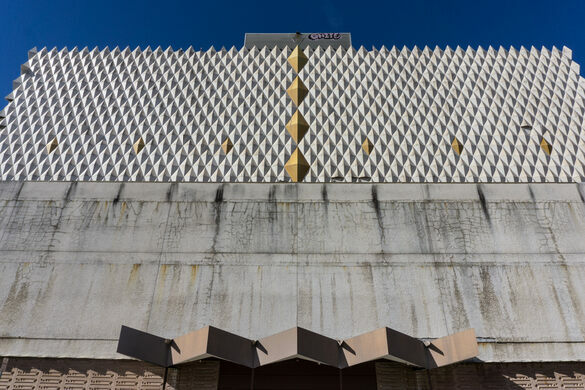 One of the most unusual and fascinating buildings in Tulsa is a huge, windowless, seven-story concrete block sitting empty in south downtown. Abandoned, dark, and in a state of decay, the Abundant Life Building could not be less like its name. Of course, it didn’t start out that way. 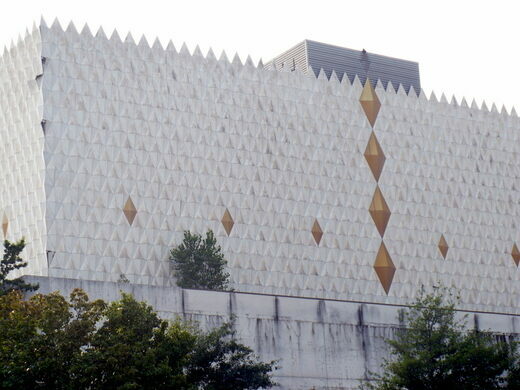 It was designed in 1958 during the midcentury trend toward modernist, futuristic architecture. It was built as the world headquarters for the Oral Roberts Ministries, which at the time was a gigantic televangelist enterprise reaching millions of followers around the globe. Oral Roberts, a prominent and controversial evangelist preacher, wanted an innovative building that represented the future for his HQ. He was a pioneer of “abundant life” preaching—a reference to a passage in the Bible —which teaches that God is good and wants to bless people with prosperity. 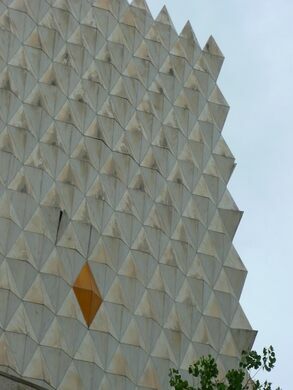 The unique exterior is covered in marble diamond-shaped facets and dotted with gold details. 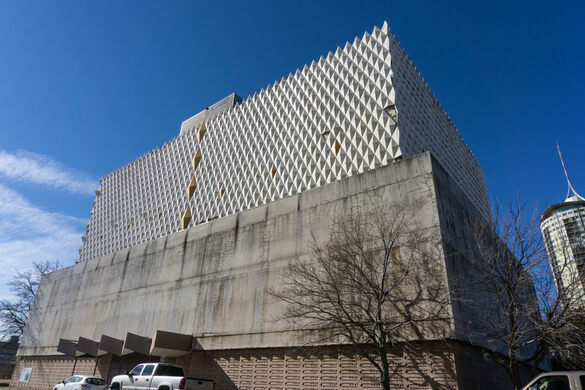 The odd lack of windows was intentional; they were deemed unnecessary given the exciting new technologies like central air and fluorescent lighting. In place of natural light, the walls were painted with bright colors. Inside, the building housed a television studio for Roberts’ broadcasts, an auditorium, and a banquet hall. The headquarters processed an enormous quantity of mail, containing millions of dollars in donations to the ministry. By the middle of the 1960s, however, Oral Roberts had moved his operation to the new university he founded in his name. By the early ‘70s, Abundant Life was completely abandoned. It has sat empty for decades, boarded up and closed to the public. 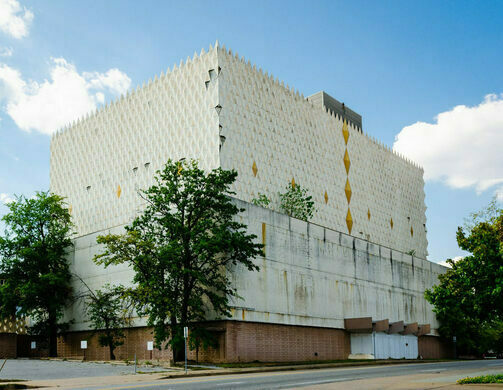 The lack of windows, far from their original intent of being an edgy and innovative design, now adds to the overall creepiness of the deserted, deteriorating building. 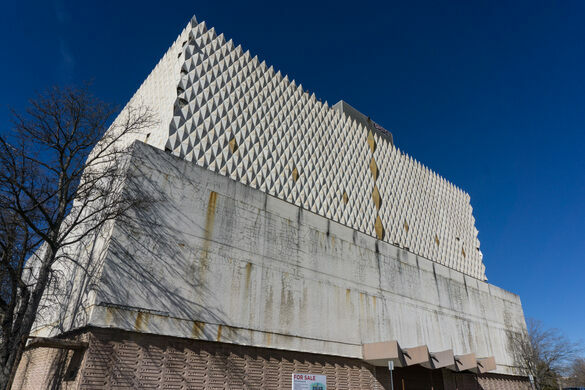 While there has been some discussion of rehabilitating this relic so that it may know a newfound abundance of life, the future remains uncertain, and the building may even be at risk of demolition.